CAT 2018 exam is knocking the door! Just 3 months left for the exam, and students are panicking and getting stressed about its preparation. Well, it is never too late to start preparing if you know the right path to go. The first step of yours should be - knowing all your exam related information well. 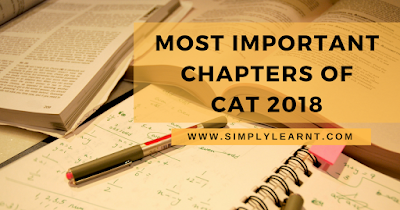 Prepare these chapters first in order to complete your syllabus in a right order that will help you crack CAT this year. How to prepare for CAT more effectively in less time? Tip #2 - You should have a study plan before you start preparation - Create a study plan according to your daily routine and follow it very seriously, it will help you to make things easy to memorize. Tip #3 - Start your preparation with most important chapters first, it will help you to complete the chapters with more weightage timely & also you can do proper practice for those chapters. Tip #4 - After completing a chapter of any subject, we recommend you to use Good Enough Meter (GEM) to analyze your performance for that chapter. Tip #5 - If the performance is not upto the mark try taking improvement test, recap test and the weekly test. It will help you to quickly increase your score for the chapter you have prepared.